As I have completed steps six and seven, the time has come for me to begin work on step eight. After working on step seven for the last little while, praying daily for God to remove my defects of character, one of which is procrastination, I don’t feel like I can put off step eight (maybe my prayers are working!). 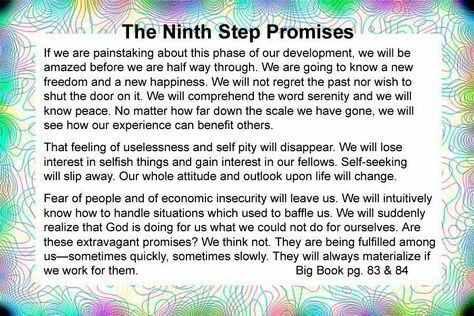 I’ve done my reading about step eight in the Big Book of Alcoholics Anonymous and in the Twelve Steps and Twelve Traditions. I also read from a couple of other books about the 12 steps and I talked to my sponsor about what it means to be willing. So it’s time to put pen to paper and make my list. I have several (probably more) people who I feel I need to make amends to for my past behavior. The list is safely tucked away in my mind where no one can see it, but I think about it everyday. I’ve talked about a few of the people on my list with my sponsor, and most she agrees with, but she’s iffy about a couple of them. You see, I think there are two different types of attitudes that we alcoholics have when it comes to the amends steps. It seems to me, from what I have seen in the rooms, there is one group of alcoholics who tend to blame everyone else for their problems and has a difficult time coming up with a list of people for their amends. Another group of people blames themselves for everything and puts everyone and their brother on their list of amends. 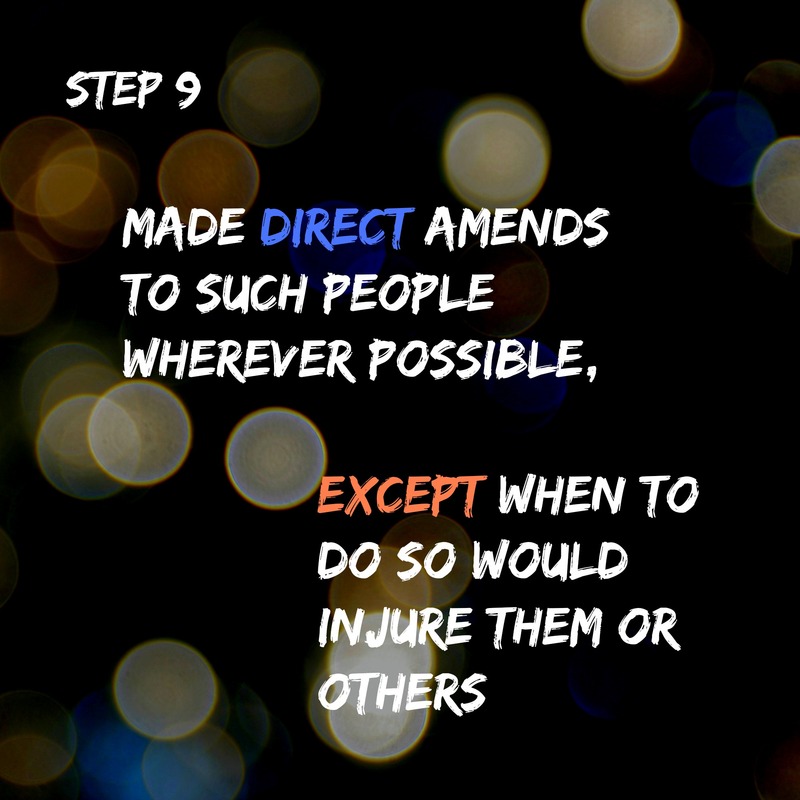 Neither is better or worse than the other, both have issues that need addressing and both have the opportunity to make things better for themselves by working steps eight and nine. For for whatever reason, I fall into the latter category and could easily make a list of a hundred people who I think I have hurt. The truth though, according to my sponsor, is that I tend to over-accept accountability, even for things that are not my fault. So my assignment is to work on my list, with explanations, and show it to her before I move on to actually making amends to anyone. Thank God for sponsors! They can often see our truths when we can’t. 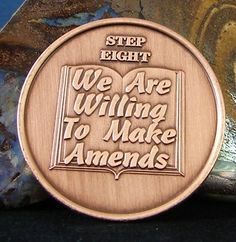 Step eight is about willingness, and I have to admit there are some amends that I am much more willing to make than others. This time around, I have some people on my list that have been there from day one but that I just haven’t had the willingness or strength to make amends too. I also have some financial amends that have been there, but I haven’t had the resources to tackle yet. Some of them are easier and I am willing and ready to reach out because I suspect the results will be positive, or at least nuetral. There are some though who I know will not be accepting, or even nice, about my attempt to right things. 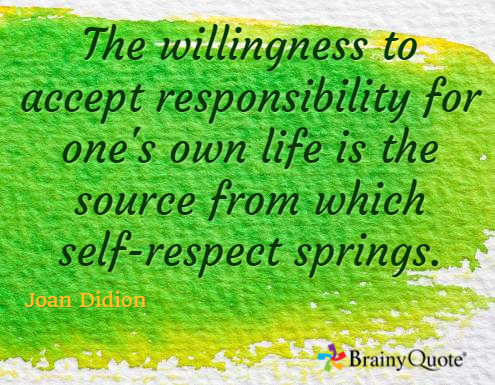 When it comes to those, my willingness, while still pretty solid, is accompanied by some fear. I have to remember that in the Big Book it says (I’m paraphrasing) that we have to clean up our side of the street, that the outcome of doing so may or may not be positive, and that the outcome is out of our control. It also says that, “Yes, there is a long period of reconstruction ahead.” By becoming willing to make amends, I am moving toward that reconstruction.